The 48 Laws of Power altered how I think about my actions and my approach to things in my personal life and in business. There is one Law of Power that has been critical for me to pay attention to, in others and in myself. Few books have changed the way I think and act as much as The 48 Laws of Power by Robert Greene. I read this over a year ago, but find myself coming back to it again and again. As someone who has started a business, I find the lessons in this book valuable to keep in mind when negotiating or dealing with other businesses. 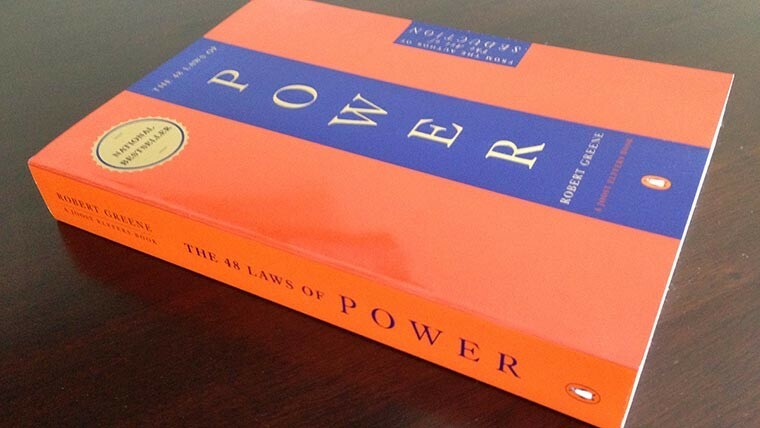 I originally read The 48 Laws of Power on Kindle, but it was so good, I wanted a paper copy. Avoid the unhappy and the unlucky. This is huge. Stay away from negative people who are miserable and hate themselves. Avoid dramatic people who feel the need to make something out of nothing. Steer clear of those unlucky folks for whom nothing ever goes right, as it will start to rub off on you. All of it sounds like simple advice, but sometimes it's hard not to read the comments section on a news article or YouTube video. Unhappy people have plenty of time to spend typing out their miseries in these places. I have seen how one negative thought can torpedo an entire day. A day I could have otherwise spent thinking about a new product, or how to fix a problem, or helping someone can get derailed by a single comment from some random internet troll, some bizarre email full of unnecessary drama, or a horrible person at the store. Don't give in! Don't let people like this–or their thoughts–take up your mental real estate. Their unhappiness very likely has nothing to do with you and can become a drain, slowing you down from achieving your goals. Now, as regards your recent Tweets about ––––––––. Your Twitter attitude is rather crappy and insulting though. You are part of a community and a rather passionate one at that. Your tweets seem to be taking aim at members of that community and almost seem intentional in their aim to rouse anger and pain. If you want to work with us to improve [...] then do so in a productive non douche bag way. Don't keep up your current approach. I will ban you [...] if it keeps up. After recovering from this virtual slap in the face, I had to admit: that was fair. I was being a negative person for no good reason. I must have been unhappy, and I was taking it out on others. No wonder people wanted to avoid me. I've changed a lot since that 2009 version of myself. I might still swear like a sailor, but I think it's pretty obvious to anyone who knows me that I'm not unhappy, and I'm definitely not fool enough to think I'm unlucky. By minimizing my involvement with others who are those things, I hope to remain positive and become ever more successful. Ryan Masuga (@masuga) owns Masuga Design, a web development studio focused on helping SMBs with content-managed websites. He's been floating in space with you since the 70's. King of Michigan. Based in Grand Rapids, MI.